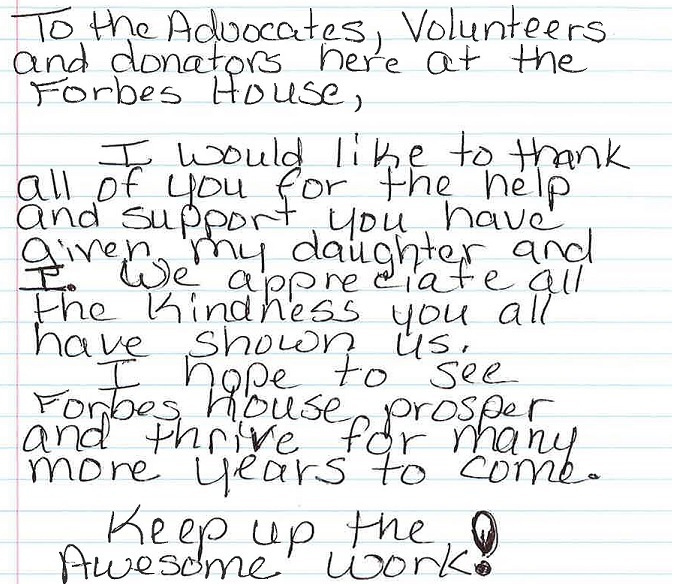 Below are true testimonials from survivors who have benefited from Forbes House. 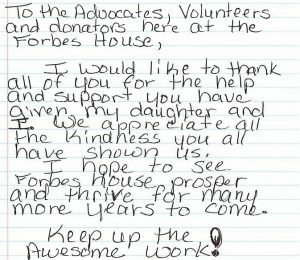 Survivors were compelled to share their experiences with Forbes House to help others. When I was seven months pregnant with my fourth child, the arguing started. He knocked me down and almost punched me in the face. The next day he apologized, and I accepted. A few months later, the arguing started again. He threw me against the washing machine and slammed me through a door as my children cried and screamed. I found out that he had been cheating on me, and my kids…told me that he had hurt them too. He had hit them with a piece of wood, used a Taser on them, and then locked them in the bedroom. I applied for a protection order against him. I called Forbes House. I felt nervous at first, but once I got there I me the most nicest, most helpful, kind, and willing to help people on Earth. … I was able to focus on myself and my kids and achieve what I needed to. Forbes House taught me to be strong, build my self-esteem and be confident in what I do. They informed me of many resources that I didn’t know about before my stay there and were always willing to listen and give advice if I needed it. I appreciated everything that Forbes House has done for me and my family. Thank you all for lending me a helping hand along with your words of encouragement, knowledge and wisdom. Each of you are phenomenal and very unique in your own special way. The day I arrived I was so scared and nervous. I cried as I answered questions the advocate asked about my situation and my horrible life. The first week my nightmares were horrible and my anxiety rough. My life felt like a dream, nothing seemed real. Then all of a sudden my eyes and ears began to open up and things became more real. I was seeing things so much clearer, especially thanks to the classes provided by the advocates. I found myself listening, reading, talking and praying. I was delivered from my past, and all my nightmares and anxiety were gone at last. I have made it through my journey and my life has been renewed. Now I have a home; college to attend; and I can spread my wings. But, I didn’t do it alone. I’m so thankful, grateful and blessed to have had so many Guardian Angels at Forbes House to help me through. I will never be able to thank you all enough for the love and support you have given me. I still have many fears, but know in my heart everything will be okay.You have helped me learn to ask for help and realize that no matter what happens, it is much, much better than how it was. I am making wonderful friends out here on the “other side of the world.” You’ve shown me how much I need the experience, strength and hope of other women. I miss you guys so much! I try each day and pray each day for the willingness and strength to handle, and be grateful for, all that God is putting in my path. Monetarily I am totally broke, but today I have love, support, food and a roof over my head.I am grateful that you were there when I was emotionally broke. That in itself makes me rich. It has almost been a year since my stay there. I’m so very thankful to Forbes House for providing the only safe place I had where my husband couldn’t find me. I was afraid for the lives of my two girls – ages 2 and 4 – and my own. Because of Forbes House we are alive today. I found reason to believe he was going to harm and maybe kill us all. You saved 3 lives!! I cannot express my gratitude enough. Being a Forbes Christmas Family this year made a difficult time a happy one. The letters you have been sending since I left are very nice too, they make me feel that you all really care. Thank you so very, very much. When I walked thru the door of Forbes House I was having second thoughts, thinking maybe I shouldn’t of came. I was scared and filled with self doubt. But days went by and turned into weeks and I was glad I chose to come to you. I had support of women that I could open up to. They were not there to judge and they could relate. You made me and my kids welcome and I found a strength from you that I forgot I had. I now know I have an opinion and a choice! Thank you for everything, you have helped me get away from a bad situation. I just wanted everyone to know that me and my children are grateful. You make a difference for women like me. Thank you for helping and giving me and my daughter a nice warm place to sleep, food for us to eat and a place to keep clean. This has been a really trying year for us beginning to end. Just knowing that when someone is in trouble that you all are here is great! It doesn’t seem like a simple thanks is enough, but that’s all we got. So thank you very much for helping us. I hope that you all will continue to be blessed and you all will be in our prayers. Thank you. God bless the angels that work at Forbes House!